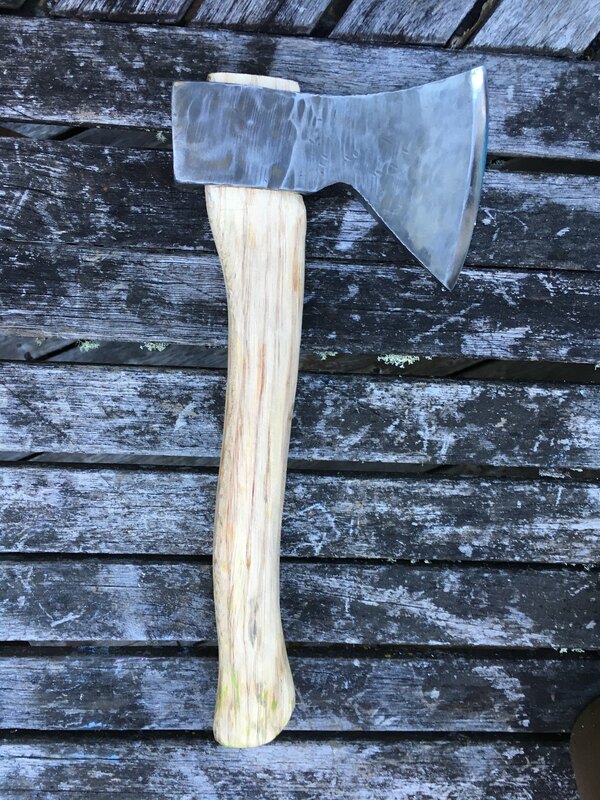 Discussion in 'Axe, Tomahawk, & Hatchet Forum' started by Kevin Houtzager, Jul 23, 2017. I'm starting this tread because @Agent_H an I wanted to exchange axes. And i Tought: Why not share it. The rules we made where as follows: Each of us was looking for an axe. In my case it was a double beveled axe (Kent Pattern) and a ballpeen hammer. I tend to use it a ballpeen a lot, since I'm also pounding sheetmetal in my spare time for cars. So, all said and done, he had both lying around. It could have stopped there, but we both thought it would be cool to exchange an axe as well as other stuff. 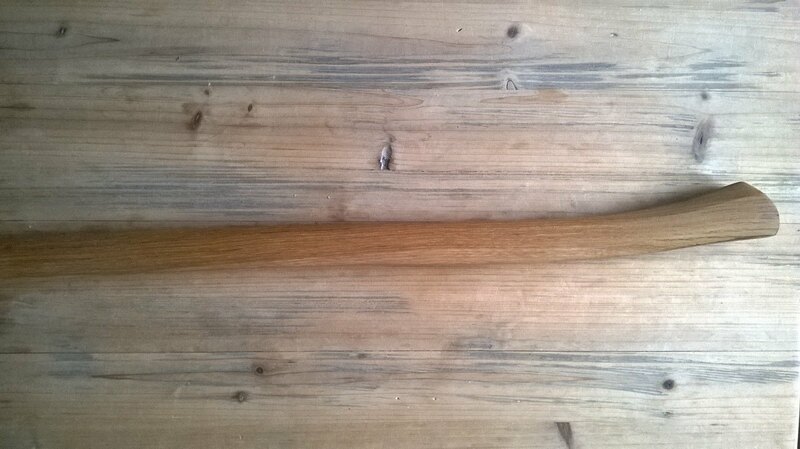 So I got him one as well, as well as an european ash handle and a stave of european yew. But since the max weight wasn't reached yet I also shipped something else. What that was? You'll read it and see it when he post it. Each payed for shipping his own package. The Package I sent came in a little quicker: Holland --> Oregon in about 5 days (excluding the weekend). Oregon --> Holland came in at about 10 days (excluding the weekend). That was yesterday. 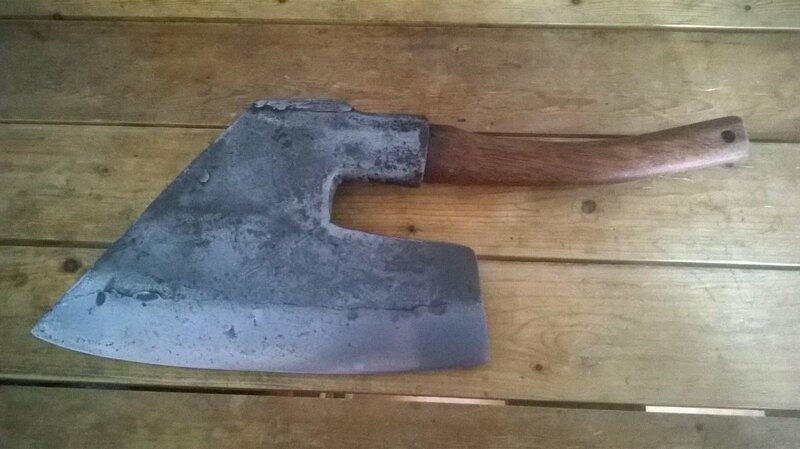 The axe thats currently on there will probably be sold outside this forum (noname axehead of about 1500Gram or about 3,5 pounds). But I will use the haft for the kent pattern. I allready measured and the eye is a bit shorter. So I'll shorten the frontside of the haft to make it fit the Kent pattern. That way its a bit better balanced as wel. It's about a half inch though, so not that much anyway. I still need to accentuate the sharp edges on the handle a bit better, but it's getting there. Its a hickory handle made of heartwood judging at the color. It's actually an old chopper one handle I made octagonal and slimmed it down quite a bit. I've allready cleaned the head and got it sharpened a bit. I also flattened the poll and since it mushroomed a lot on the sides an the surface. I also sanded most of the black stuff but left the pitting on there. Low spots aren't that much of problem anyway, but the black stuff has a lot more resistance when cutting. It's currently in the magic-juju-sauce since its currently to shiny for my tasted. Once it's out, its protected from the elements. All in all, it took me about an hour to get everything done. 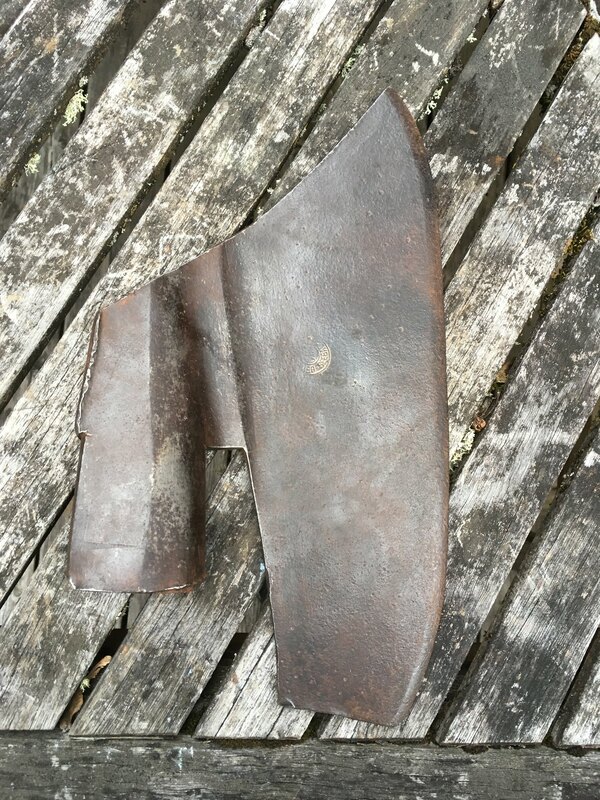 As for the axehead itself. I believe it's quite old: 1800-1840 to be precise. The reason would be that the kent pattern dates back to about 1700. But it's still made. Except this one is made mostly of wrought iron. I say mostly, since the bit has a steel insert and is hardened. So that makes it about 1700-1840. Right around 1840 sheetmetal became widespread and wrought iron wasn't used anymore. But, it also has a hardened poll. Not that hard I might ad, but still hardened to about 40-45 HRC. 1800 is about the time that carpenters axes became hardened, as it was the time the square nail became widespread. So I actually believe it's 1800-1840 ish. 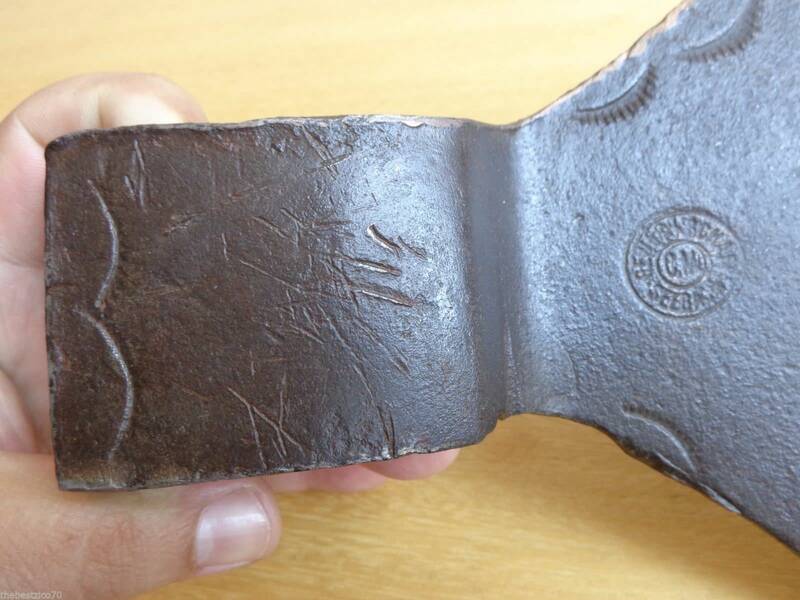 It could be an English axe brought to the colony, or it could be a colonial US made one. If anybody has any info I would like to know. My axe will probably be ready in the next couple of days. If there is an update I'll post it here. Since his came quite sharp. I believe he's allready hung his axe. Moonw, Square_peg and Agent_H like this. Right on Kevin! The Dutch-Oregon Trail - nice. The one you sent me is hung and ready to use but don't have much for internet where I am here on the coast right now. I'll will post pictures up this evening when we are off the road. protourist, Moonw and Kevin Houtzager like this. Agent_H is one of the best dudes that hang in here, I can vouch for that from experince. I like Kevin as well . And from the first time you mentioned you had a deal with someone, I could bet it was Agent_H and a hewing ax was involved . Agent_H and Kevin Houtzager like this. And likewise MoonW. Thank you. 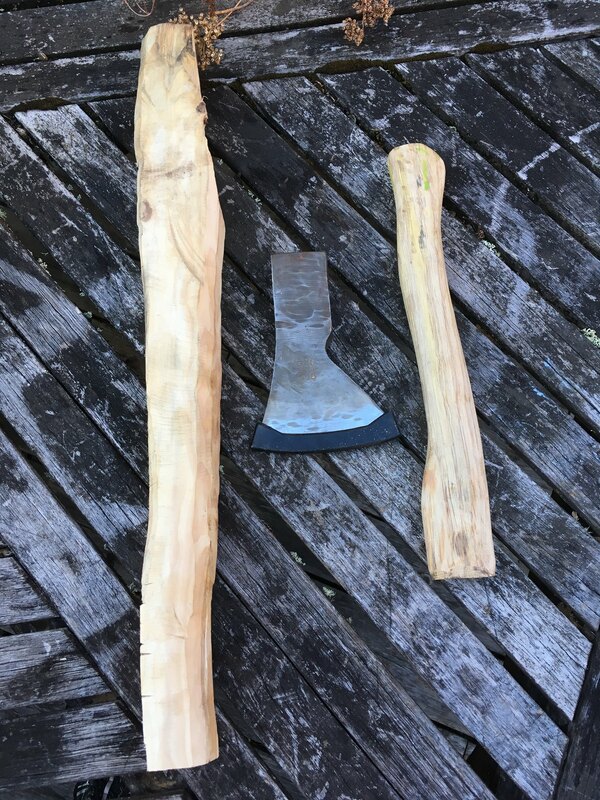 Let's make that 2 hewing axes! When is the second one coming in @Agent_H ? Same goes for both of you! Thanks, Kevin. I can get them here at reasonable prices sometimes, we had Germans live in Transylvania for quite a while, so every now and then you can pick up an old goosewing for example. But I appreciate the offer nonetheless! 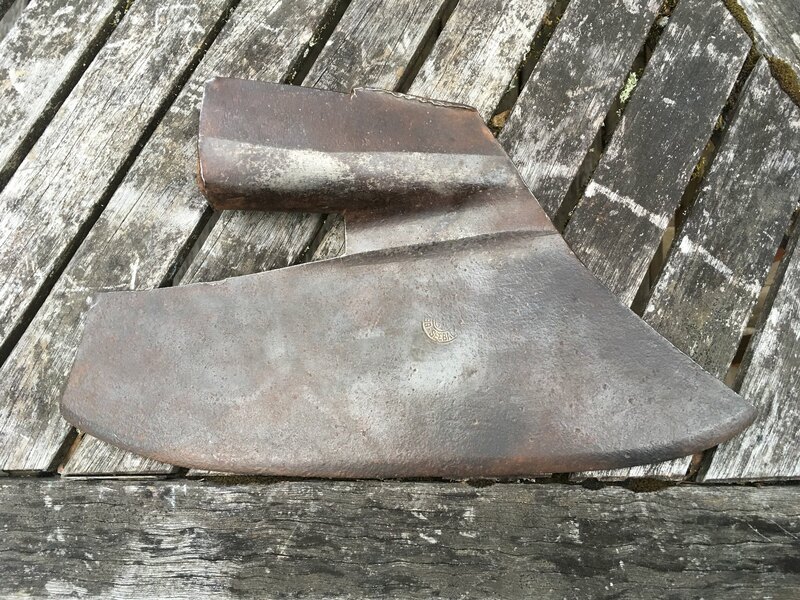 It wasn't so much an offer, as its the facts that Agent H gets 2 hewing axes: One German, from me and another austrian/german goosewing in good condition which I helped set up But If your looking for something just let me know. You have my email. 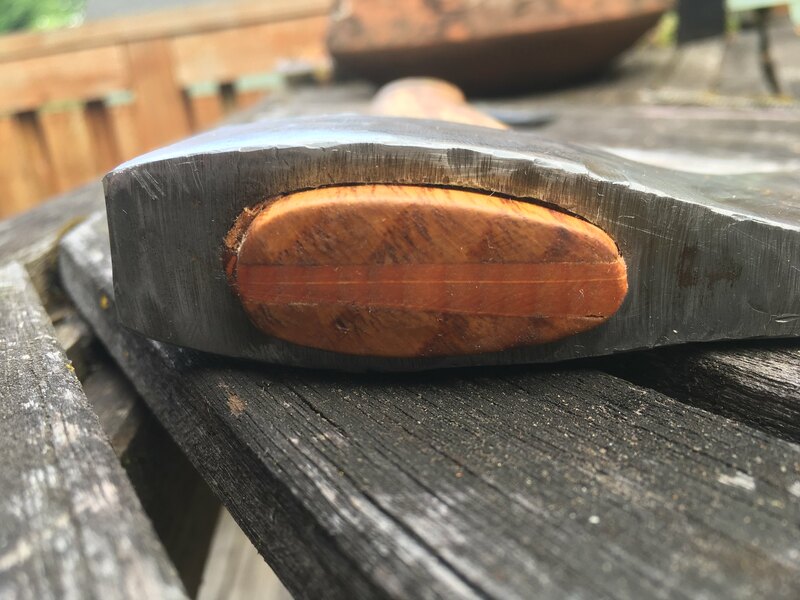 Yew stave, handle, and the DIN 5131 600 single bevel hatchet head. 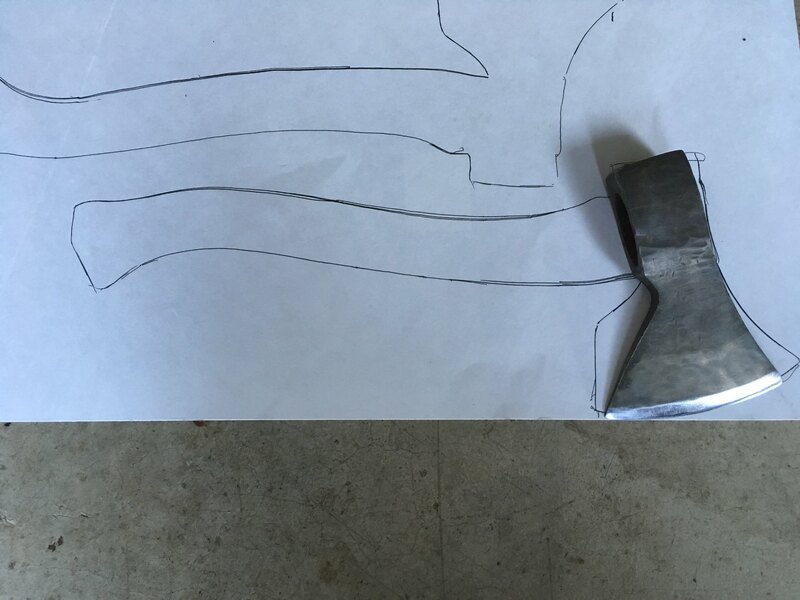 There is also a hammer head that Kevin sent that didn't make it into the first photo shoot. I'll get up here as well. 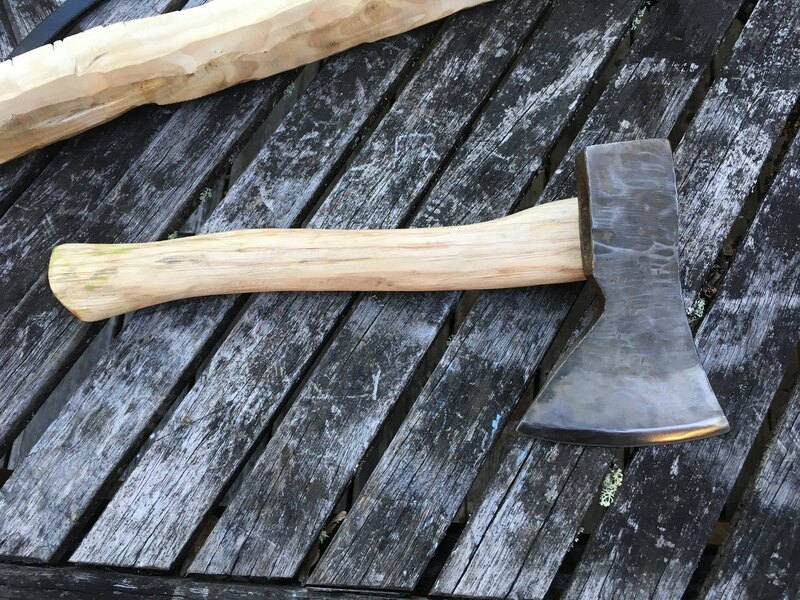 The yew stave is just the right size to make a handle for a Kellokoski 61.2 or maybe even two separate hatchet handles - that will be super fun in and of itself. Getting a piece of locally sourced wood was a cool surprise. 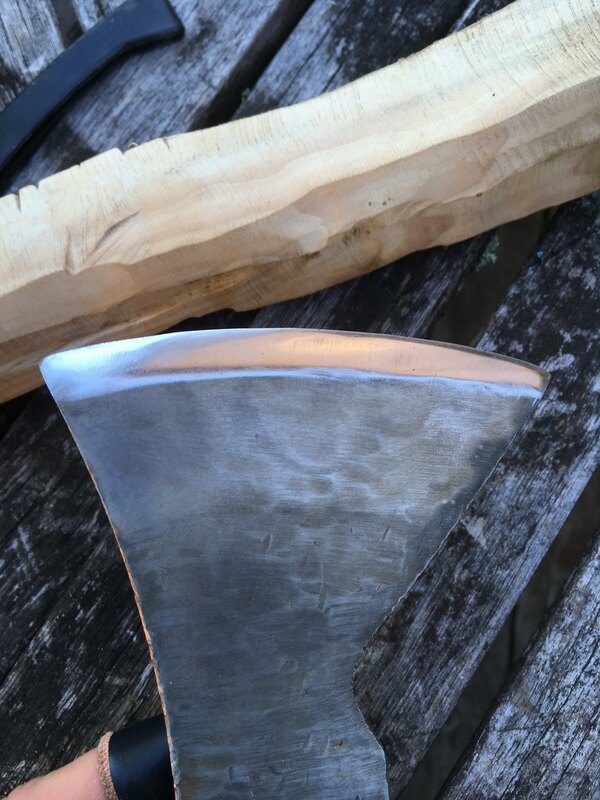 The wedge was made from the same wood I used to carve the handle for a Russian axe – I think it’s birch. Seems a touch softer than the handle wood. The whole package is taking up all the BLO I can throw at it. It went with me this weekend and the several people who picked it up didn't want to put it down. In fact, my brother "forgot it" in the gunwales of his boat - little salt air seasoning. Buying things is always impersonal, trading things can be fun if both parties are on the same page. 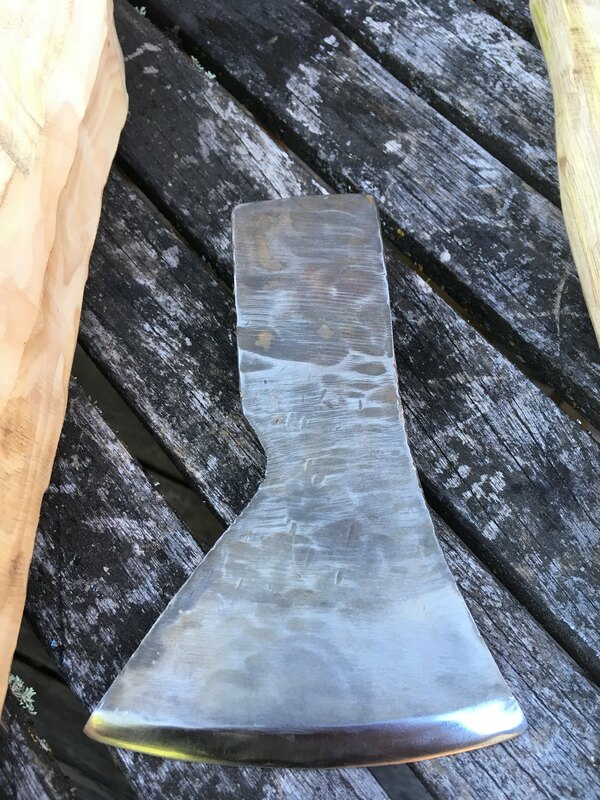 Kevin also put me in touch with a cool tool guy that offered me a large hewing axe for a price I couldn't pass up - a price I wouldn't have passed up for a pick-up here even with the international shipping. I'll get that up here as well when it arrives. Now I want to see what Kevin has done with the Kent pattern that finally made it to the Netherlands! FortyTwoBlades, cityofthesouth and Square_peg like this. Turned out really nice As for the DIN number: It's a number for the german market only. 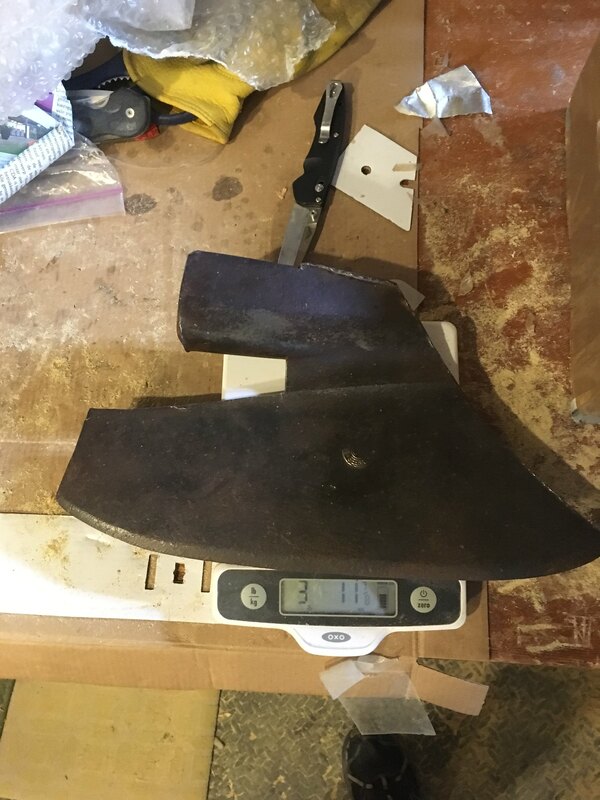 5131 is the manufacturing standard for hatchets. 600 Is the headweight in grams. 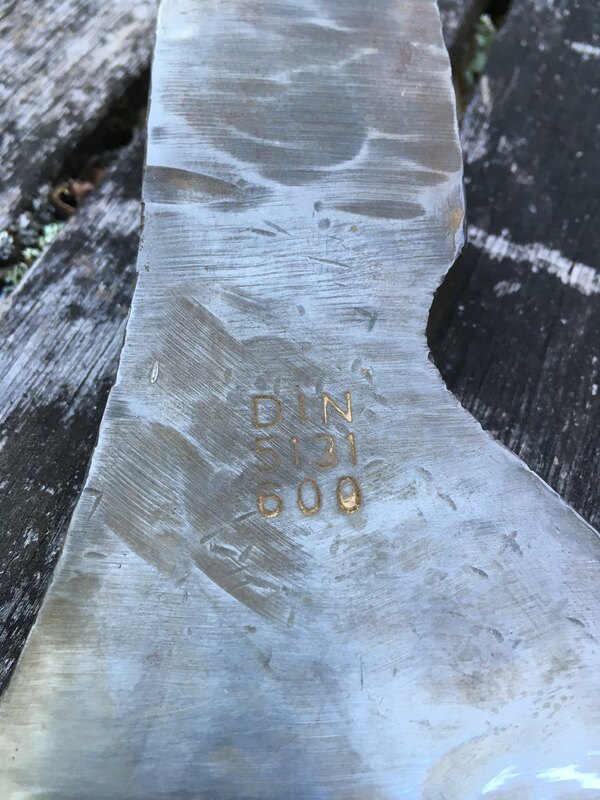 Originally it had gold paint of the rough surface of the axe (still visible on the lettering) and it's from somewhere in the 80. 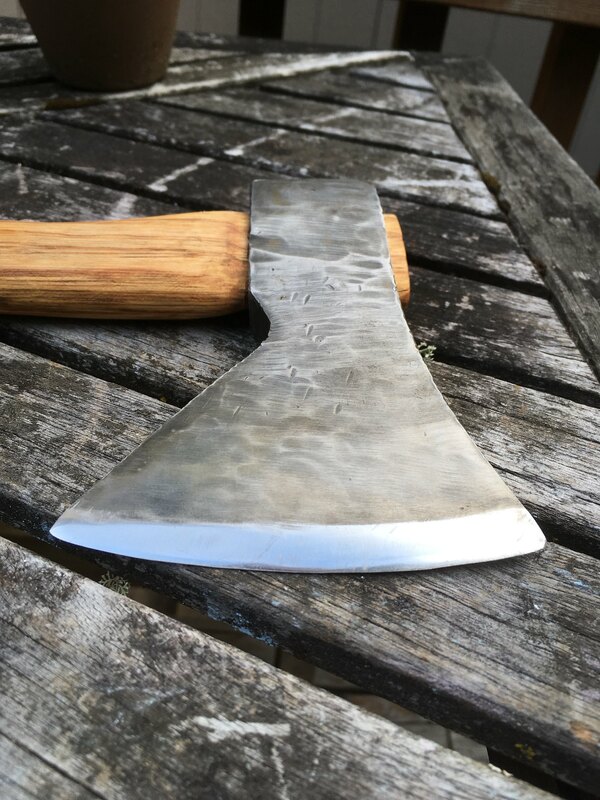 As for the manufacturer: It's Helko, allthough it isn't under there own branding, since they normally don't make single beveled axes. Want I don't know is the actual brand that carried this axe. It's probably some obscure brand that I don't even know about. Really glad you liked it! And know I like to see you make some wooden shoes with it Just kidding, as even I have never tried it. 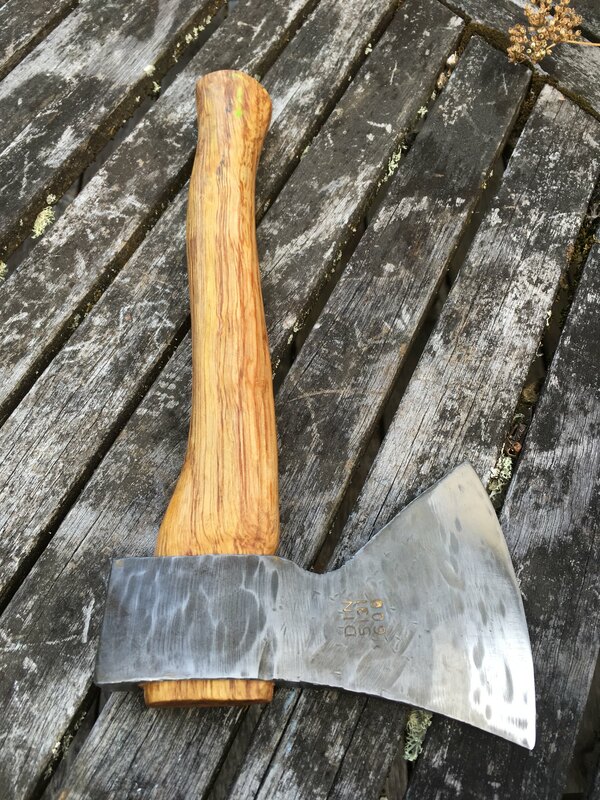 I did try your axe with a piece of wood as handle on a stave of birch. And it'll work just fine! As for a sneak peak. It still isn't finished. But it is sharp and hung (although without a wedge) It's hung on a full size handle "36. I had to trim it down quite a bit, as it's smaller size eyre then I though. No biggie, but that means a lot of work has to be done to make that part octogonal again. So when thats done I post another photo. Other then that: Good to go! 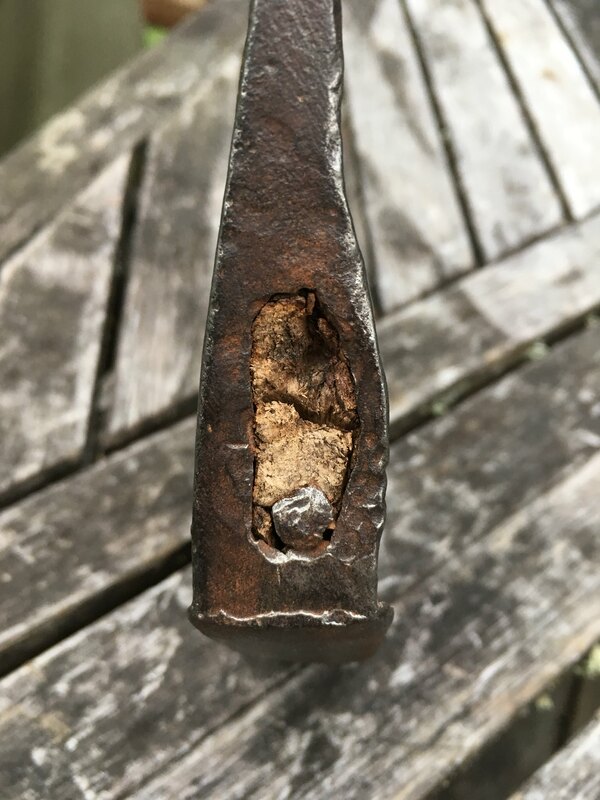 As for the hammers: Still searching for a vintage handle. The shop I normally go to was closed (vacation) starting today for 3 weeks. The others only have regular handles. So that leaves me with making an octagonal handle from one of the regular ones! And whatever you do with that yew: Guard it with your life. That stuff is genuinely rare, expensive and most of al perfect for handles. If you find nots in it, just leave them in the handle. Should be fine. If your planning on using it for the kellokoski it'll be the most perfect wood you can think of! FortyTwoBlades, Square_peg and Agent_H like this. Kevin that is going to be a fine looking tool. At about 3lbs I picture it working well on that length. The heartwood handle is a nice rich color as well. I'm enjoying this thread. Carry on, I'll follow along. Edit. Moving to Flickr is easy as pie! Photo should work fine again! The Goosewing flew in last night. 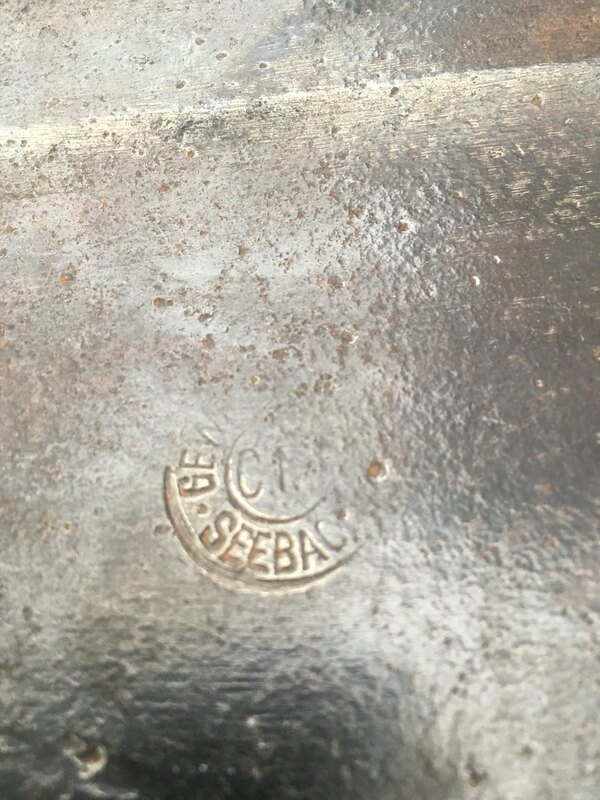 I believe the makers mark is GEWERKSCHAFT C.M SEEBACH like this photo lifted from an auction. 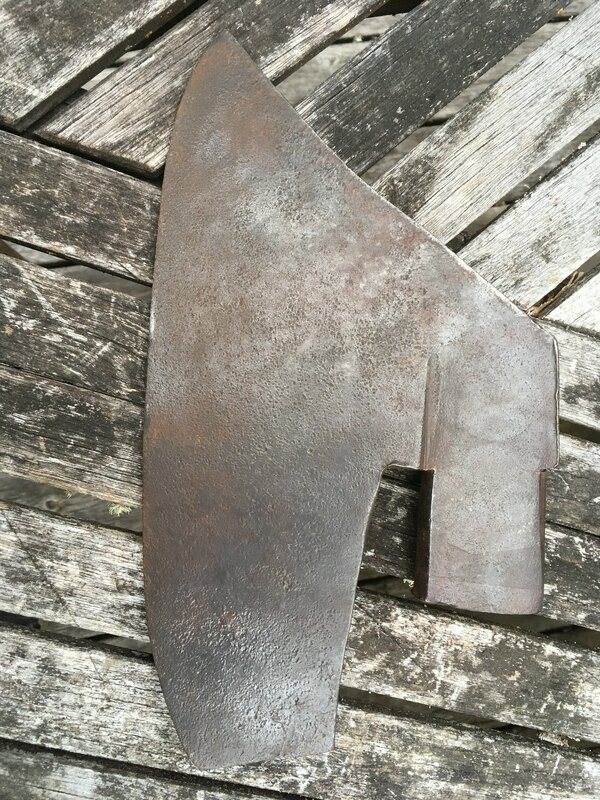 What does a good handle on a smaller goosewing look like? Upswept, mainly straight, or even more offset in line with the eye towards the user? Once again, something I would never have the opportunity to try out without reaching out or defaulting on my mortgage lol. 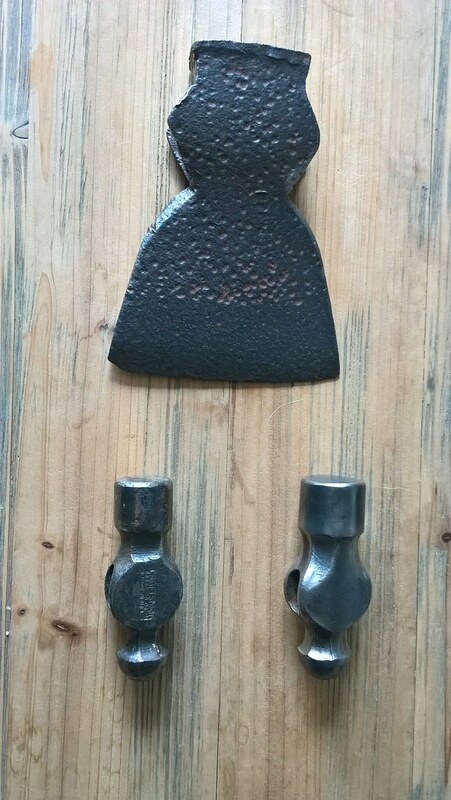 And a small addition to my drawer full of "metal wedge things"
That's a lovely axe! 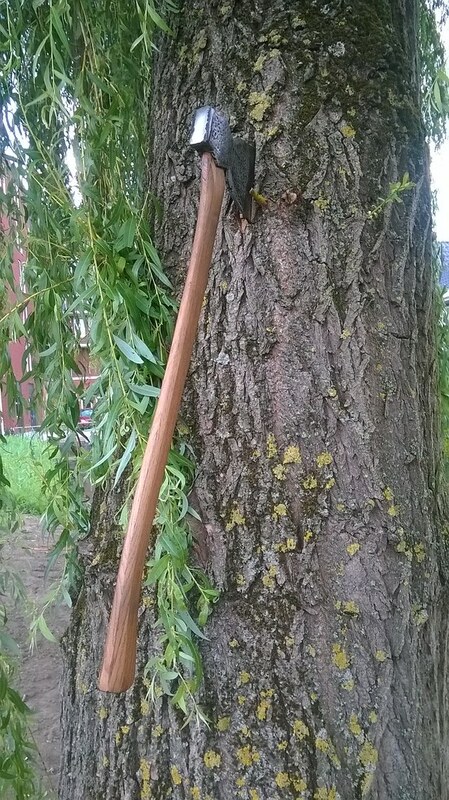 I would make an upturned handle for it, 24"-28" long. It appears to have some offset already built into the eye, is that correct? Square_peg, the eye is offset. This one is considerably smaller than some that I see on line but that might be my interpretation of some of the photos. Many I see have handles that are 1 to 1.5 times the length of the blade - from pictures at least. Long enough to get both hands on but not much more - hopefully Kevin will chime in being 9 hrs ahead of us on the west coast. Upswept seems to be a great start. Dubois is doing a Holly handle on a similar (super fine specimen of something but of course!) that I might try to approximate. It does show wear, especially at the heel, but I don't need something I will not want to use. @Kevin Houtzager saw this deal and put me in touch with a great guy. 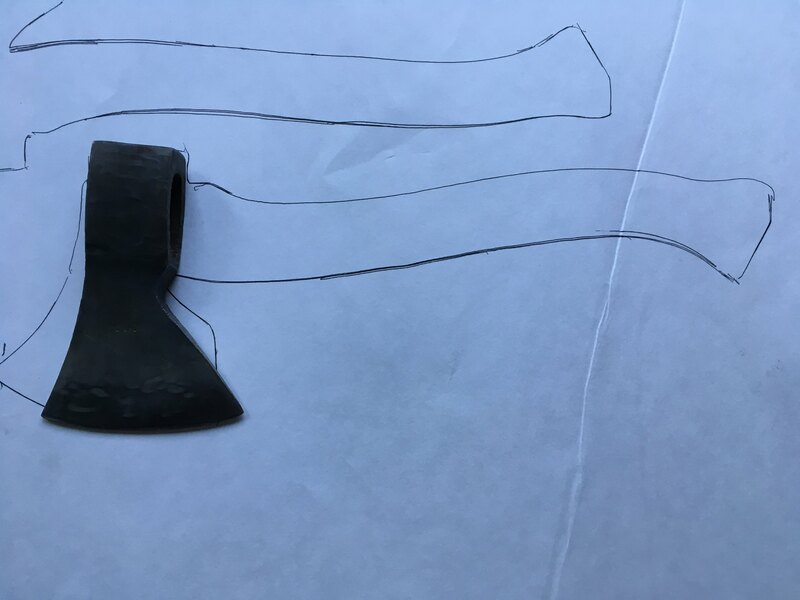 Kevin also detailed wire transfers, provided links to German versions of auction sites, coached me on what to look for with these style axes, and hunted axes there for me, and really does have some pretty good stories. He's been super helpful to say the least. Kevin Houtzager and Square_peg like this. No biggie! It's my neck of the woods, so why not? I actually have acces to most of the local sites in all of Western Europe and Scandinavia. It looks nice though, and I wasn't even aware that it's marked. The markings are spot on in any case, but I cant find info for the life of me. As for the handle: Way shorter! My handle is currently sticking out 10", so about 15" handle would be the way to go. You can still use it with both hands if you like, But I'm working it with one. My handle is made of Red Meranti. I tought it would actually break, but its still perfectly in tact. I wanted to make it nicer, but I haven't come around to it. It works fine as it is, so why bother? 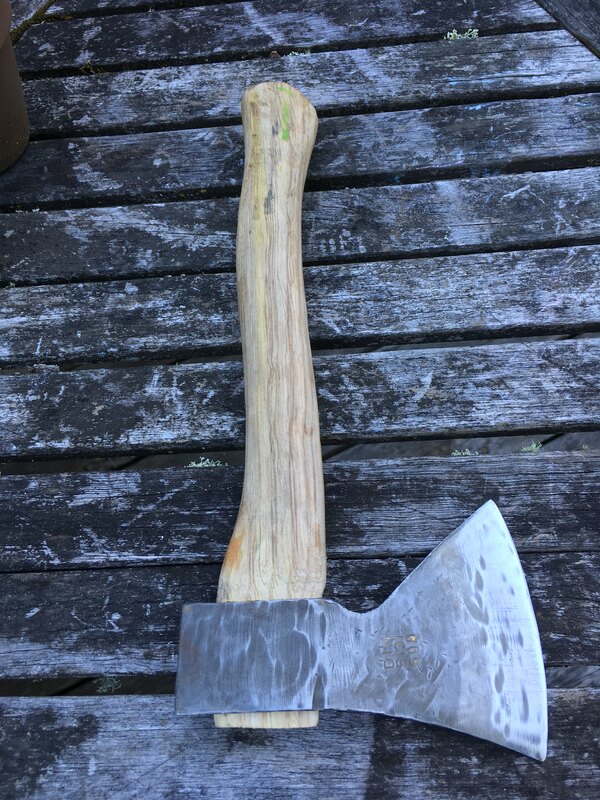 You could make a longer handle, but it can get unwieldy and comes in with to much force, damaging the wood and the axe. There isn't a set length in any case, so the sky is the limit. But normally its a back breaker since you use it hunched over. Mine's actually a bit heavier: Close to 6 pounds (a little over) not counting the handle. How long is your axe exactly? Mine measures in at 12" height measured straight and 8" wide. The eye tapers quite a bit on mine. It goes down to about an inch by a half inch up top. I don't think its much smaller then mine? I haven't seen any bigger ones in quite some time. The model was used as a halbard though. I had one but sld it a long time ago. That measured up at 16". And thats the biggest one I've seen by far. What you need to do now is make a nice arch from the heel to the toe. Get the straight bit out as much as possible. The edge is dependant of the wood you are cutting with. Mine is actually quite shallow: At the moment its 22,5 degrees. It'll give less tear-out that way. The second photo shows a halfway mark. The current state has an edge that is like a mirror. It's my go to axe when making furniture. Brian77 and Agent_H like this.